(Interfax – MOSCOW, June 7, 2013) Russian President Vladimir Putin’s press secretary Dmitry Peskov has called for treating the president’s private life with respect and not intruding into it. Peskov refrained from answering Interfax how Vladimir and Lyudmila Putin’s daughters had taken the news about their divorce. “Anything that concerns Vladimir Putin’s private life concerns only him, and he has never made it public. This is his principle, he has deserved this right, and let’s treat it with respect,” he said. Peskov said he was unaware of Lyudmila Putin’s plans and did not know whether she planned to leave the presidential residence in Novo-Ogaryovo outside Moscow. “I am not informed about this,” he said. 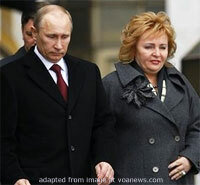 Vladimir and Lyudmila Putin announced their intention to separate after visiting the premiere of the ballet Esmeralda based on Victor Hugo’s novel Notre Dame de Paris at the Grand Kremlin Palace on Thursday evening.